Pre-vet student Kelsea Lynn Schult feeds one of the newborn twins she delivered at the OSU Sheep Center. 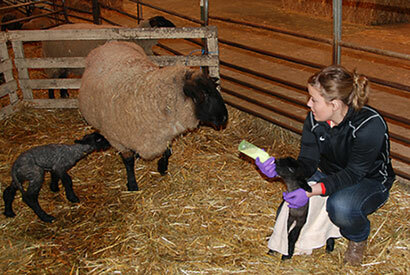 Despite a substantial reduction in the number of sheep in the OSU sheep barns, CVM students are still getting some terrific experience by helping with the lambing this spring. Last year an outbreak of Q fever and Johne’s disease in the flock required managers to test and remove infected ewes. Then they implemented a radical clean-up process that included resiting the flock and removing everything in the sheep barns, including the dirt, all the way down to bedrock. The next day, in another pen, pre-vet student Kelsea Lynn Schult delivered a pair of new twins and was helping them learn to suckle. The oldest was getting the hang of it but his younger brother, still wobbly and shaking, couldn’t figure out where to go and what to do. Schult heated up a bottle of colostrum and fed him by hand. She named the timid little guy Wallflower. Sheep barn manager Mary Meaker is taking extra precautions to ensure no further outbreaks of the diseases. All the baby lambs will be tested and no outside animals will be introduced to the flock in the future. The lambing season, normally open to the public, is closed this year as a precaution.